It stimulates the activity of enzymes involved in the metabolism of glucose for energy and the synthesis of fatty acids and cholesterol. 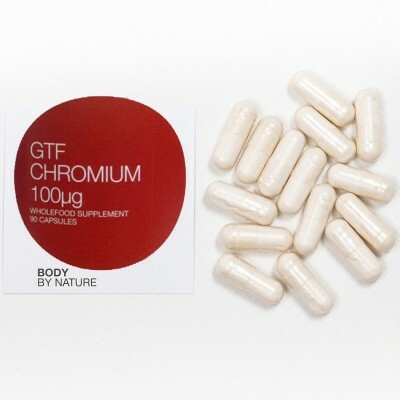 Body by Nature Whole-food GTF Chromium is better absorbed and longer retained than isolated chromium. There are two main types of chromium. Trivalent chromium is the type found in nature and it is the type we use in our product. The other type is a toxic and carcinogenic industrial chromium. There are nine essential micro-minerals or trace elements, chromium is one of those. Supports and maintains normal blood glucose levels. Has been shown to contribute towards normal macronutrient metabolism. Stands for ‘glucose tolerance factor’. Research undertaken has proven that abnormal glucose tolerance could be reversed by brewers yeast. Further studies have shown that trivalent chromium was responsible for the turn around. Taking an adequate dose of chromium might be a way of preventing the progression of abnormal glucose tolerance into type II diabetes. GTF promotes the activity of enzymes involved in the metabolism of glucose for energy and the synthesis of fatty acids and cholesterol. Simply put, when chromium levels are low in the human body, so are GTF levels which means the activity of insulin is blocked and blood glucose levels are remain heightened. Body by Nature Whole-food supplements are unique in that they are made from minerals that have been hydroponically-grown into a cruciferous vegetable that is a member of the broccoli family of vegetables. This plant is an edible species which has a great capacity to bio-accumulate high levels of minerals to enable good levels to be achieved in small doses of supplementation. These are the only genuine Whole-food supplement products on the market, and early research testifies to their superb bio-efficacy. All our Whole-food products use food metabolic pathways and are suitable for vegans. Dicalcium phosphate, microcrystalline cellulose, capsule shell (hydroxypropylmethylcellulose) hydroponically grown cruciferous vegetable (Brassica Juncea) providing chromium, silicon dioxide.